Three Music alumni of the University of Surrey have won Vice-Chancellor’s Alumni Awards, announced in the University’s Annual Review 2016. 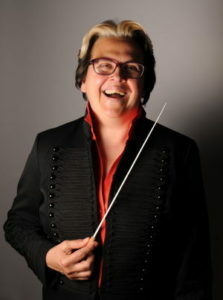 American-Cuban conductor, composer, and record producer Odaline de la Martinez (MMus Music, 1977; pictured) won the inaugural Alumni Lifetime Achievement Award. This award was introduced by the current Vice-Chancellor in 2016 as part of the University’s 50th anniversary celebrations, to recognise a graduate who has made an exceptional contribution in their field or to society in general and who is an exemplary role model. The first ever female conductor at the BBC Proms, Odaline de la Martinez is internationally recognised for her promotion of Latin-American, women, and contemporary composers. She has been the artistic director of contemporary music ensemble Lontano since 1976, founded the LORELT record label in 1992, and recently conducted the first complete recording of Ethel Smyth’s The Boatswain’s Mate by Retrospect Opera. Her full biography may be read here. Australian conductor, composer, and educator Dr Kathleen McGuire (MMus Music, 1995) received an Alumni Achievement Award, and conductor Lee Reynolds (BMus Music, 2007) an Alumni Young Achiever Award.